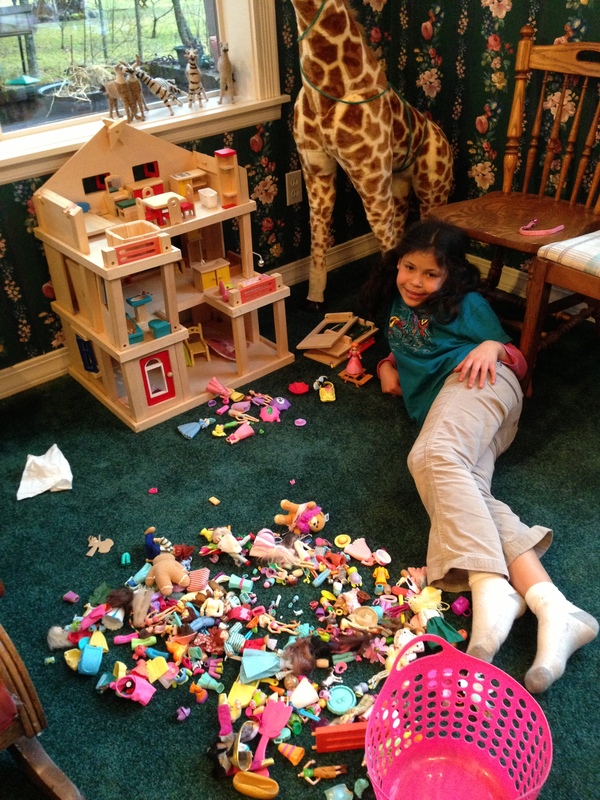 Do daughters of doll collectors become fans of dolls as well? There has been a recent discussion on my doll email group, about daughters and dolls and how some daughters of collectors love them and others just aren’t interested. With Seneca I am not sure yet, she loves certain dolls, but I have no influence, she chooses what she likes. 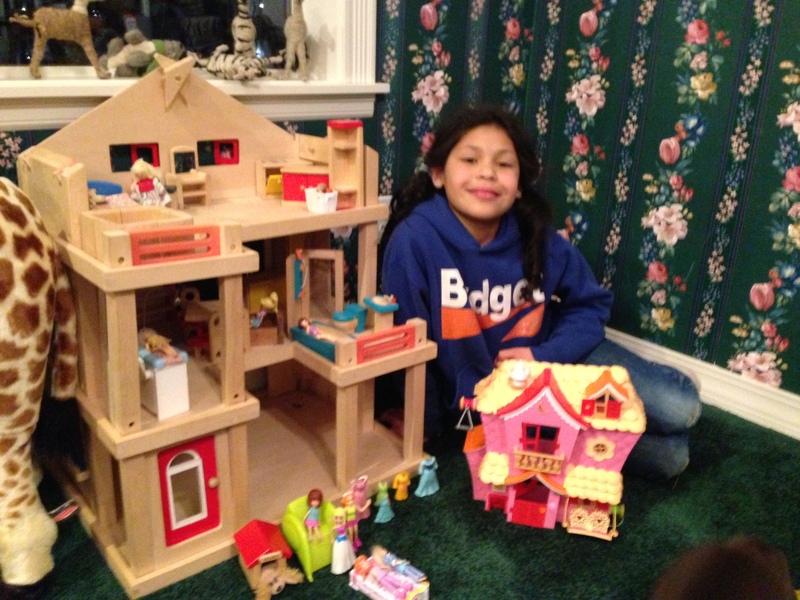 A friend helped us get this wooden doll house which sits in the family room and gets many hours of play. It is the first thing visiting children want to play with. 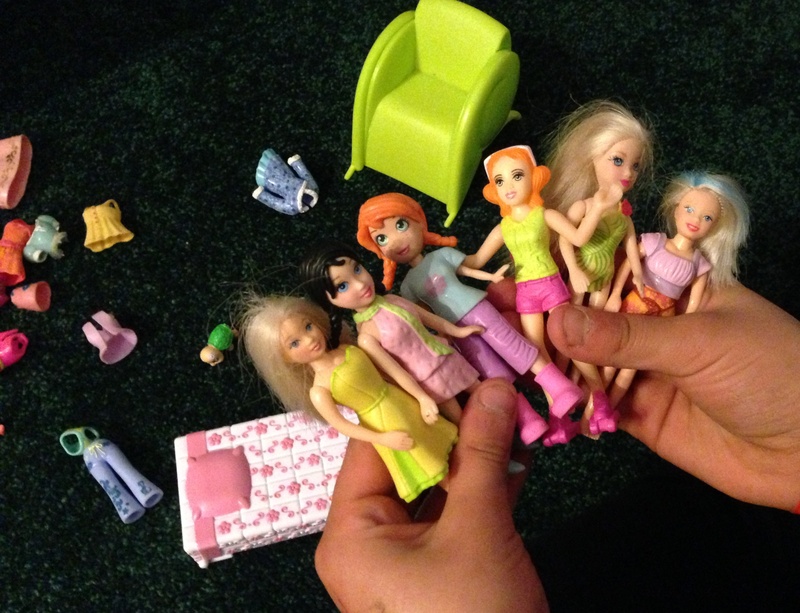 It is peopled by little plastic dolls which Seneca calls “Polly Pockets.” Their clothing is colorful and made of mostly of flexible plastic. 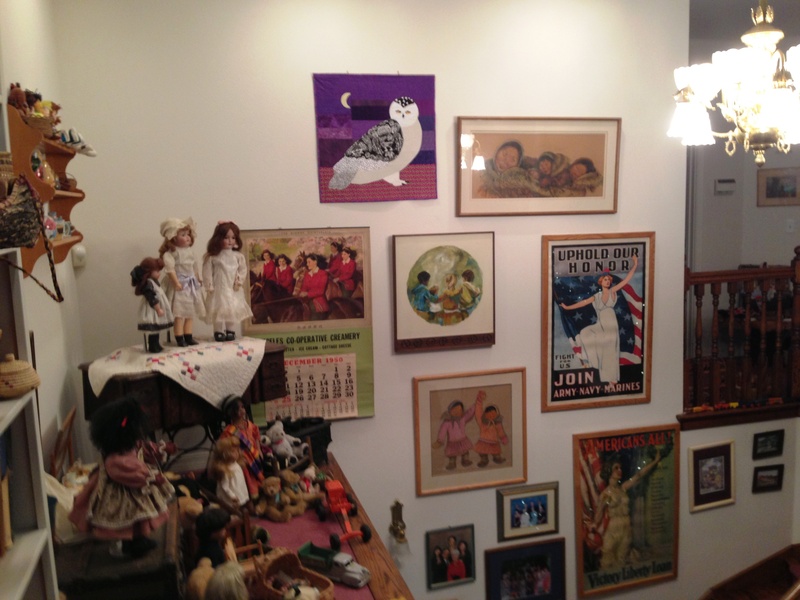 The dolls, for the most part, have come from garage sales or from the Goodwill and she has a large collection. The furniture, mostly wooden, is almost to scale and she has some plastic furniture as well. Seneca, and sometimes her older brother, who will remain nameless in this blog, spend hours in imaginative play, stopping intermittently for an argument. Right now they are getting ready for a party where they plan to perform a song for the guests. And they are hunting for a puppy who seems to have disappeared. And now they have morphed into home school, which they think would be terrific until I remind them that I would be the teacher. These two dealt with a lot of unpleasant stuff as little kids and I tend to think they are working through that rather than loving the doll aspect, but time will tell. I hope we have a budding collector! I need to share a letter Seneca delivered to me yesterday. I am saving this for one of the times I feel like throwing in the towel. We have lived in this house for nearly 18 years but had never repainted inside the house. Recently, after much discussion about color, Ted started in the dining room. It is now a citrus and cream shade of green with a darker green accent, in the areas where we get the most fingerprints. This meant changing things a bit and updating what we had hanging on the walls. 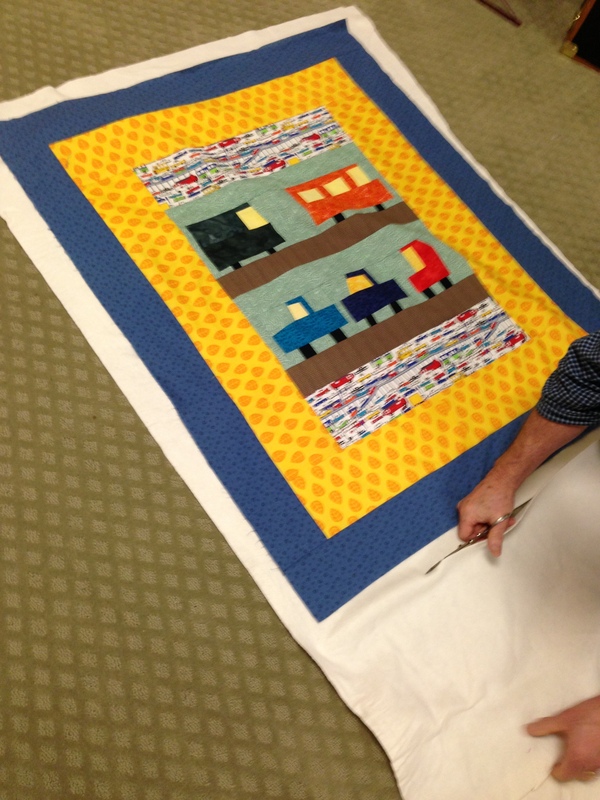 My friend Mary, who died last summer, is the person who got me started quilting. 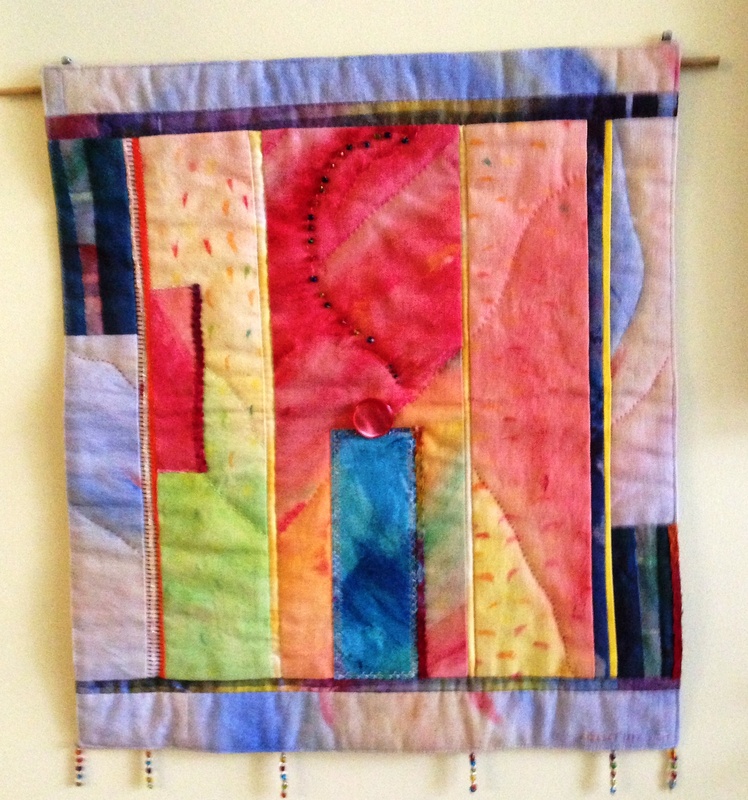 She created “art” quilts in her later years and she named one after me. 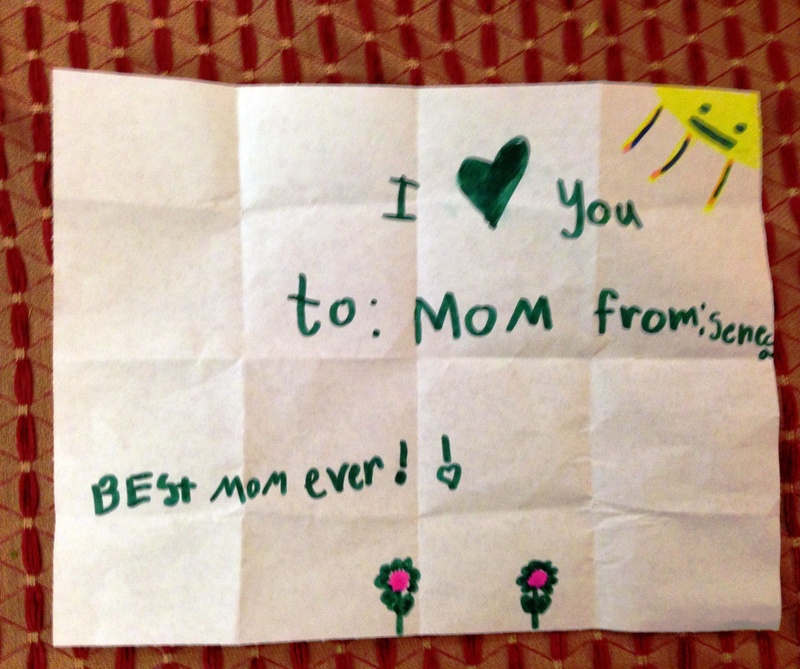 I was thrilled when her daughter offered to send it to me. It is actually a wall hanging, and it takes center stage in the new arrangement. 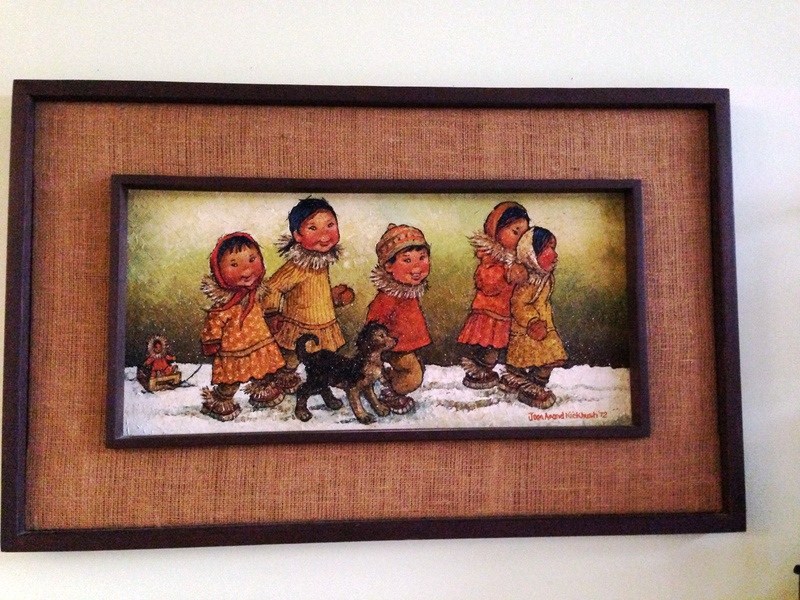 Ted and I have enjoyed the paintings of Joan Kickbush She is famous for paintings of native children in Alaska. 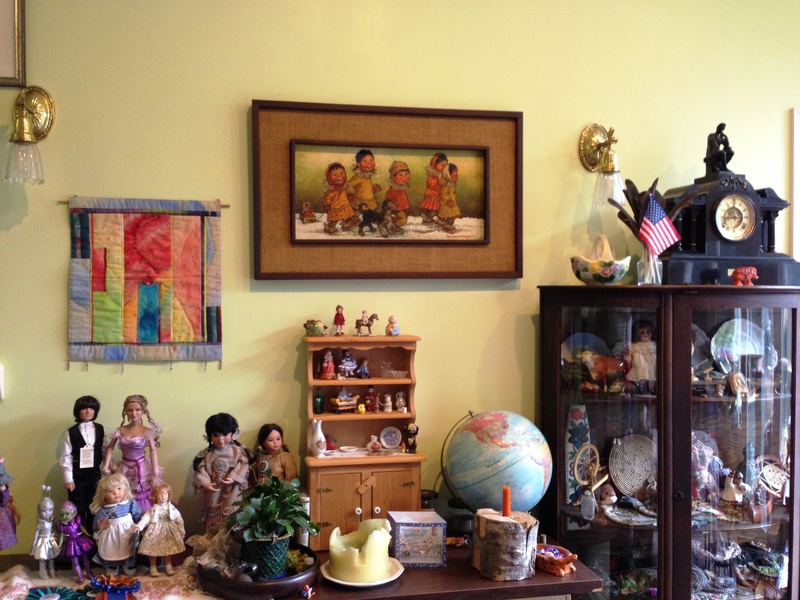 Ted has a two of her paintings in his office and there is one hanging over the couch in our family room. The painting that we have moved to our dining room was painted in the 1970 with green overtones (remember avocado green refrigerators) and we had it hung very high in our two-story entry way because the green color was a bit overwhelming. However, it is perfect on the new green wall next to Mary’s wall hanging. Notice the little doll being pulled on a sled! This move left space in the entry way for the new snowy owl wall hanging which I just finished yesterday. It is big and bright and it needed a quiet corner where the owl could look down without being disturbed. I am very happy with the new arrangements. We had been at the beach house all weekend and hadn’t gotten to the beach so we decided to go for a beach walk early this morning. 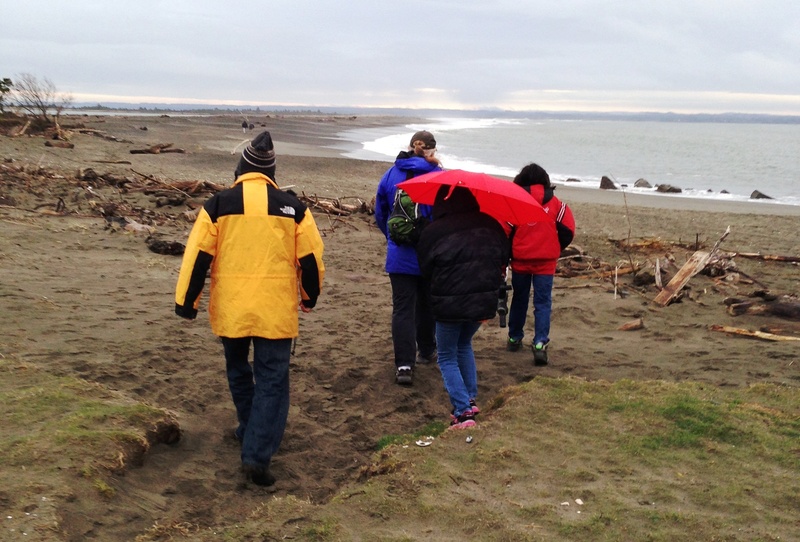 A friend had offered to take us to an area where snowy owls have been seen recently. It was raining when we left the house but ten minutes away, when we were ready to start walking, it had stopped. It was chilly though and Seneca carried an umbrella, just in case. The tide was out and we walked for about half an hour until Mike told us we were in the right area and he began to set up the telescope. 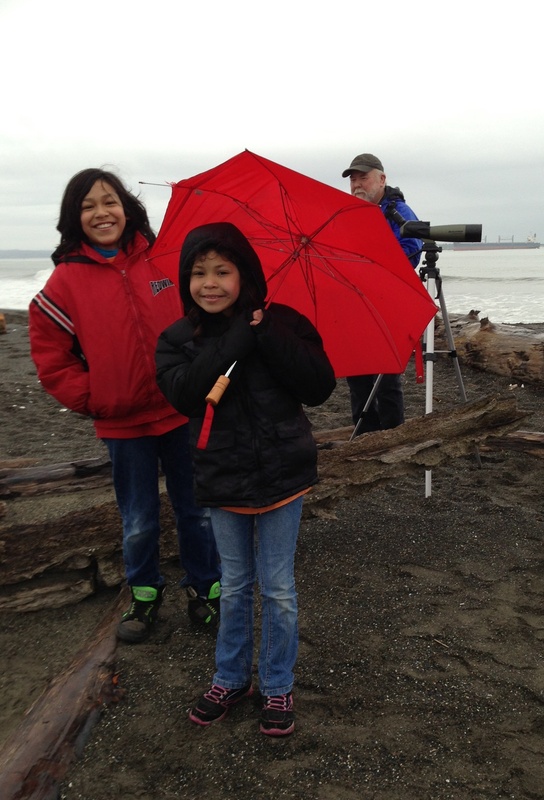 However, there were no snowy owls in sight. Mike speculated that they were hiding from people who had been there the day before and tried to get too close to them. We were nearly back to the car when it startedraining again, but we had a nice walk in the fresh air. 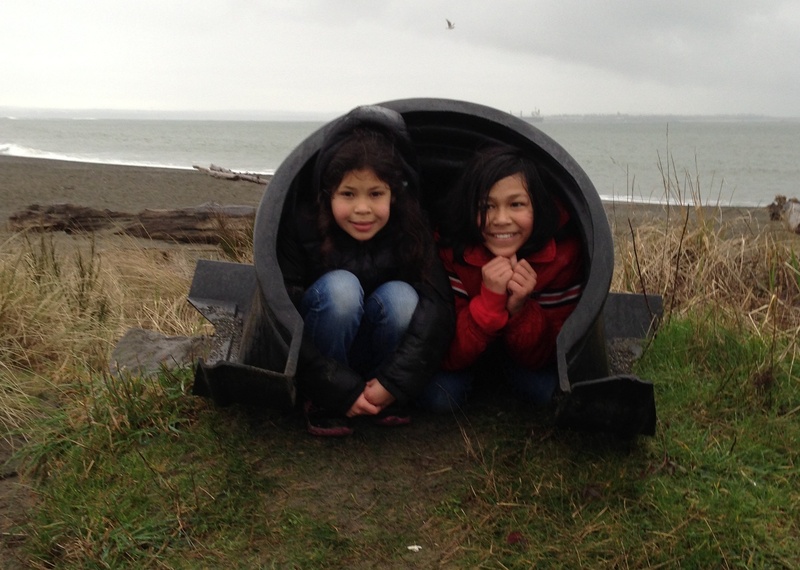 They found an abandoned culvert on the beach and waited out a rain shower. And I was inspired to finish the snowy owl wall hanging I started a long time ago. 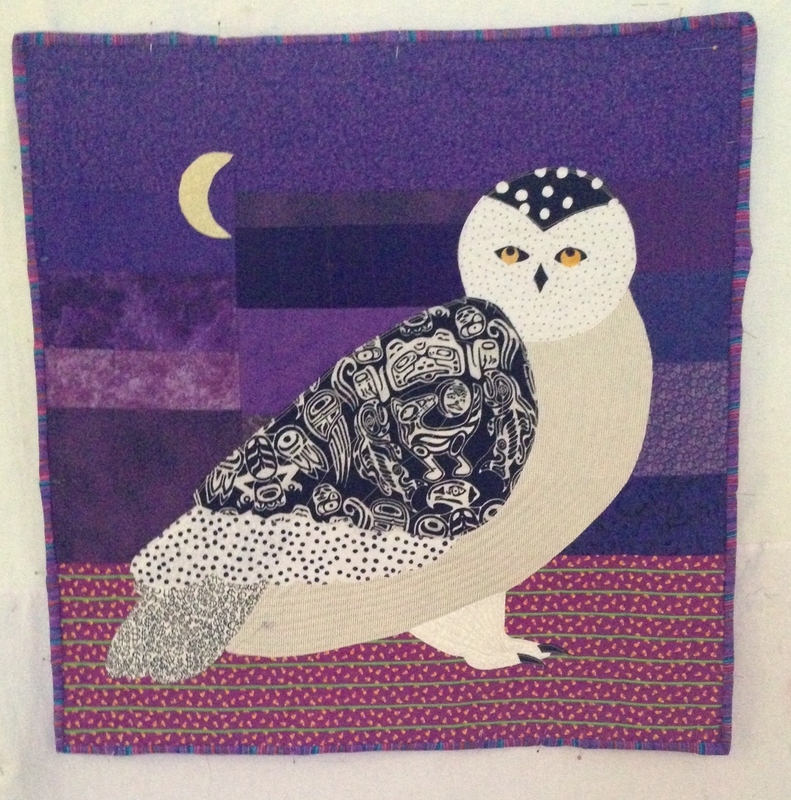 The owl needed to be stitched to the background, and it needed to be machine quilted. That is what had caused delay, I wasn’t very confident regarding machine quilting. I gave it a try though, and am quite happy with the result. It is now finished except for sewing down the binding. 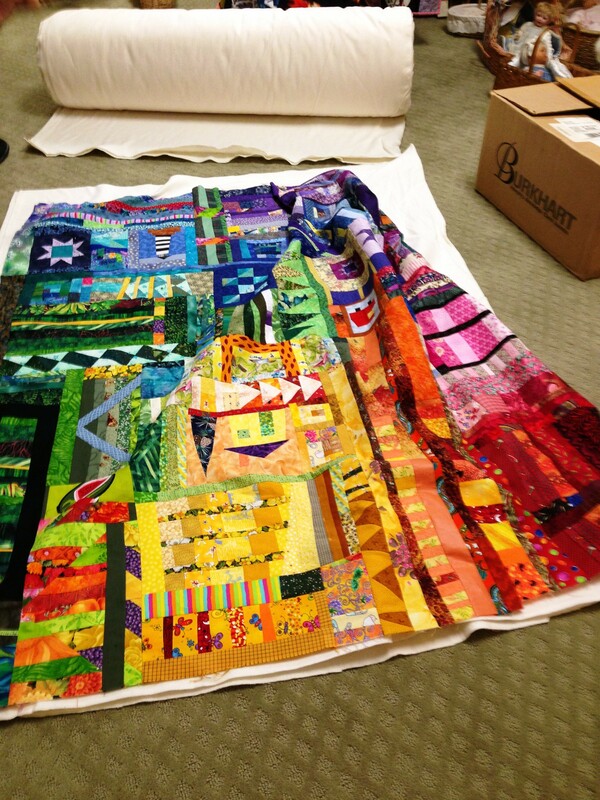 So, for the Quilting Retreat I have accomplished quite a bit. For the Liberated Rainbow, I have made the backing and sandwiched it and taken it to a friend who will machine quilt it. 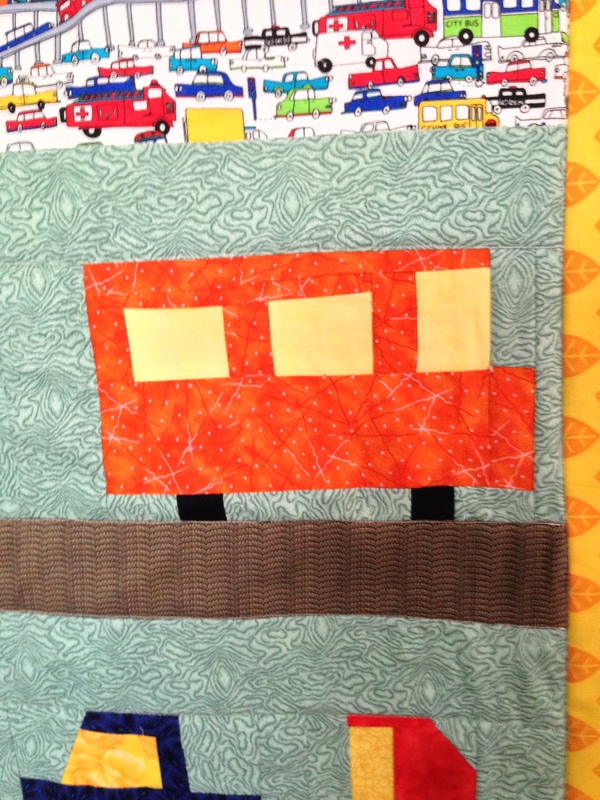 I finished the Boy Quilt number 2, quilted it and it just needs to have the binding hand stitched down. Raven and I quilted the sides of the drum bag but I need to get a large zipper when I get back to Port Angeles. 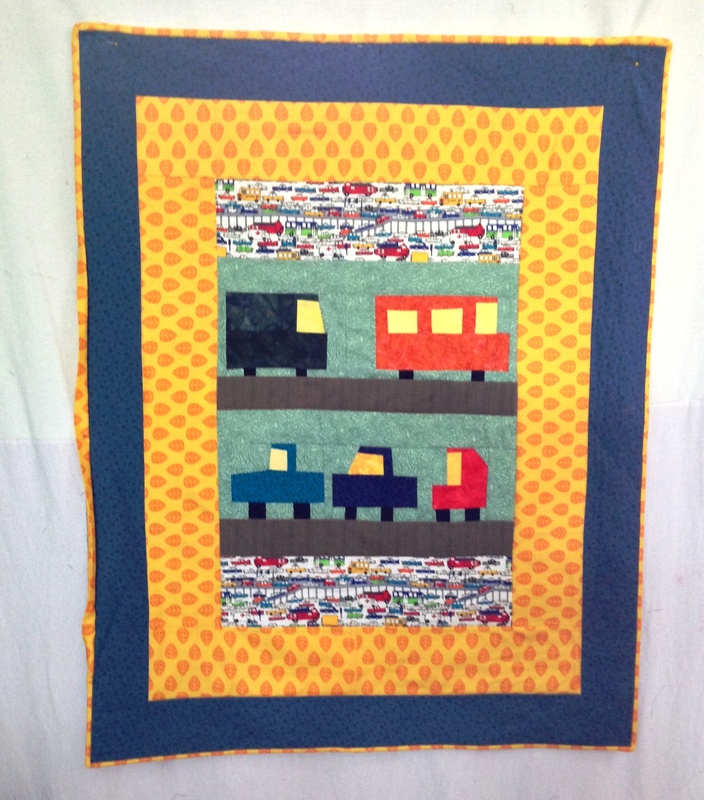 I finished the Little Boy Quilt with the trucks. And I made ten blocks (small) for the new quilt I am planning and hand quilted several blocks of an ongoing project. It was nice to be able to focus on sewing and I love the retreat idea. And Ted, was able to create some lovely bowls, with some uninterrupted time in his workshop. 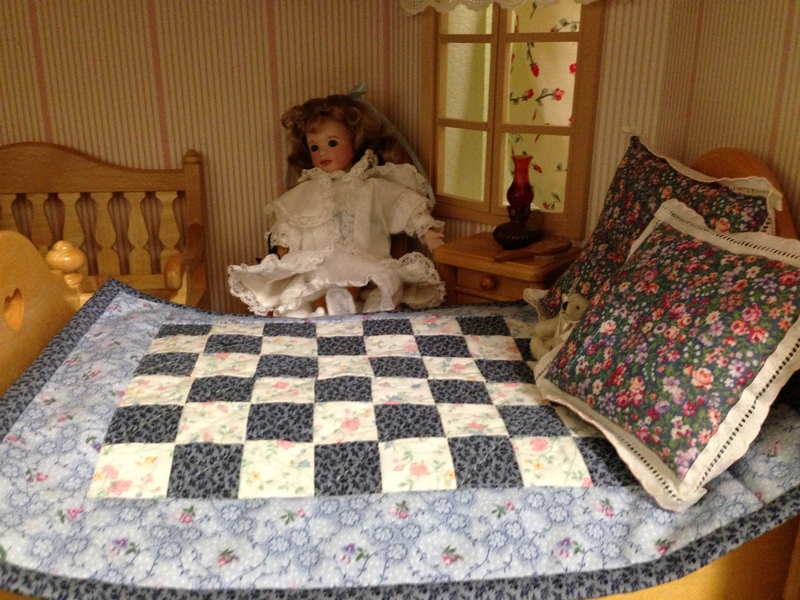 This is the weekend of the “Virtual Retreat” for my on-line quilting group. I have been planning and preparing for several days so that I can accomplish as much as possible during the retreat. However it was afternoon before I was able to begin sewing. Ted and I were registered for an 8 a.m. class on how to operate our new iPhones. This was in Silverdale, an hour and a half from home which meant a very early departure with the kids. From there we drove to our beach house for the retreating to begin. As Ted had said he would, he promptly went to his workshop for his own retreat. Our church had cut down some ornamental trees and Ted had asked for a few pieces, he was eager to see if they would make nice bowls. The kids entertained themselves pretty well though the did get me involved in one game of Bingo. I was able to make lots of progress. First I finished the quilt I have been making to be given to a little boy in crisis. It is always harder to get folks to make security blankets for little boys, so that is what I try to do. The binding wasn’t finished when I took this photo late this afternoon, but it is now!! 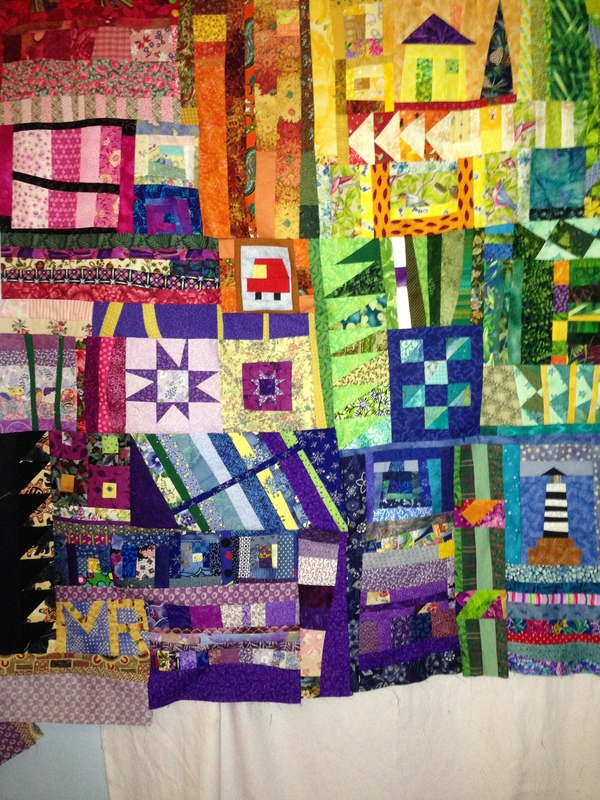 A few days ago I received a box of blocks and scraps and odds and ends from Ann in Virginia, part of the World Wide Swap the on-line quilt group is doing. Ann knew I needed kid’s prints for the foster child quilts and she sent a stack of blocks already sewn. I decided to go ahead and sew them into a second boy quilt and it went together very quickly. I will probably get the back and binding on it tomorrow. Next I chose fabric from my stash and made the back for my Liberated Rainbow Quilt. This project is far from finished choosing the backing was a big step. Ted helped me cut the fabric, and do the arithmetic. The last project for today was to choose the fabric for the drum bag we need to protect Raven’s new drum. Raven helped. Then I cut the fabric and got it ready to be quilted. I let Raven help with the stitching which he loves to do. 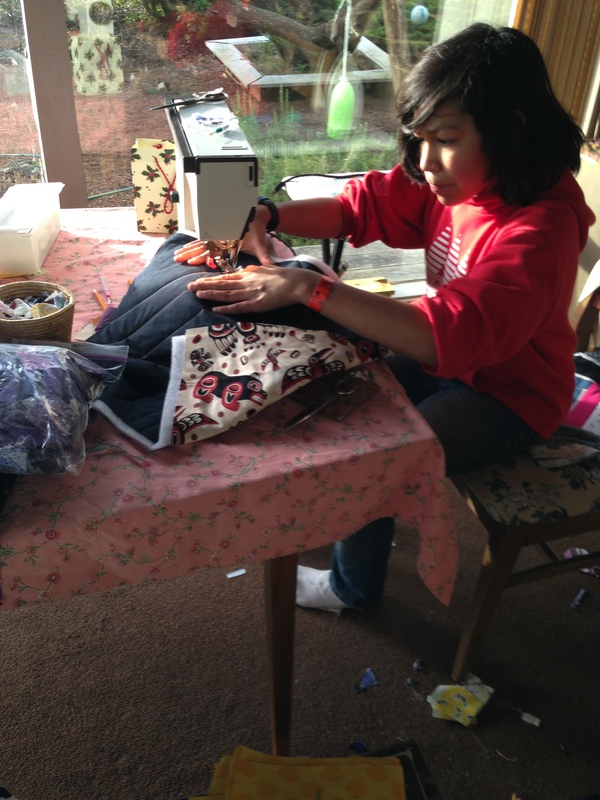 Other quilters are posting photos on their blogs and on the group Yahoo site, lots of sewing is happening! 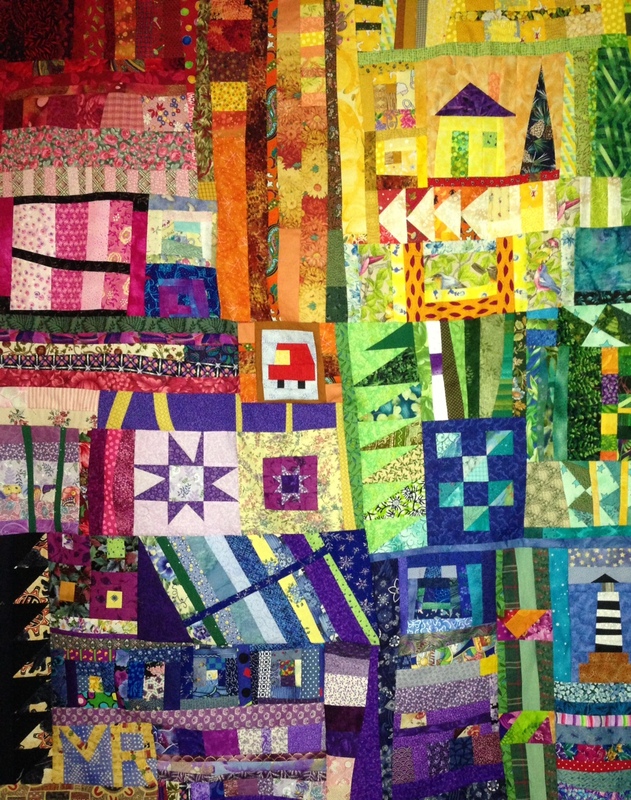 I belong to an online quilting group that is having a “virtural” retreat this weekend. The idea is to stay home, give yourself lots of sewing time, post pictures of your quilts as you go along, and ignore the house, cooking and other chores. This, of course, is what you would do if you were on a retreat at some far away exotic place. I informed Ted that I was planning on participating in the retreat. He said he too was planning a retreat, in his workshop. Oh my, what will the kids get into while we are busy? I have been working on my list of projects for the retreat, and doing a little prep work. First I want to make the backing and sandwich (that is quilters talk for attaching the back and batting to the quilt top, which is the pretty part). This is for the quilt I call Liberated Rainbow, which I started many months ago. 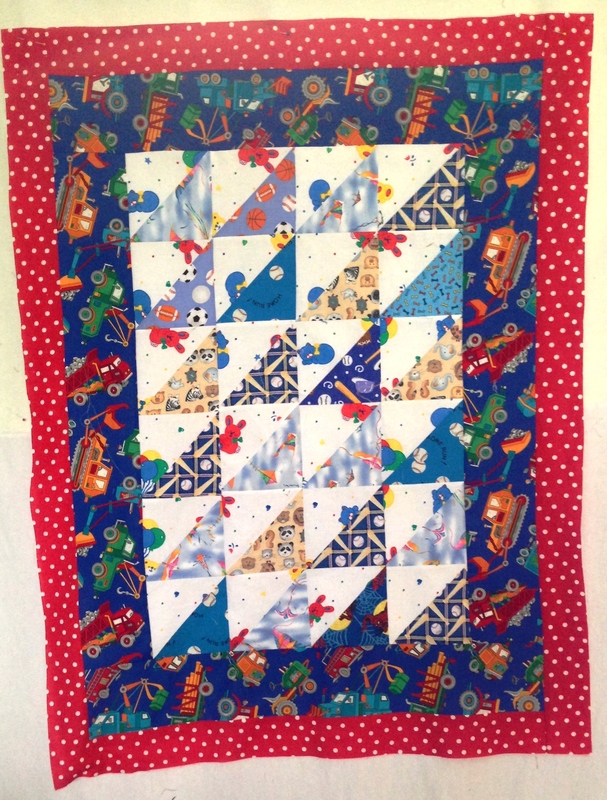 The second project is to bind and machine quilt this little-boy-quilt I made to be given to a foster child in crisis. Doing the little trucks and cars was like figuring out a little puzzle for each one, fun. 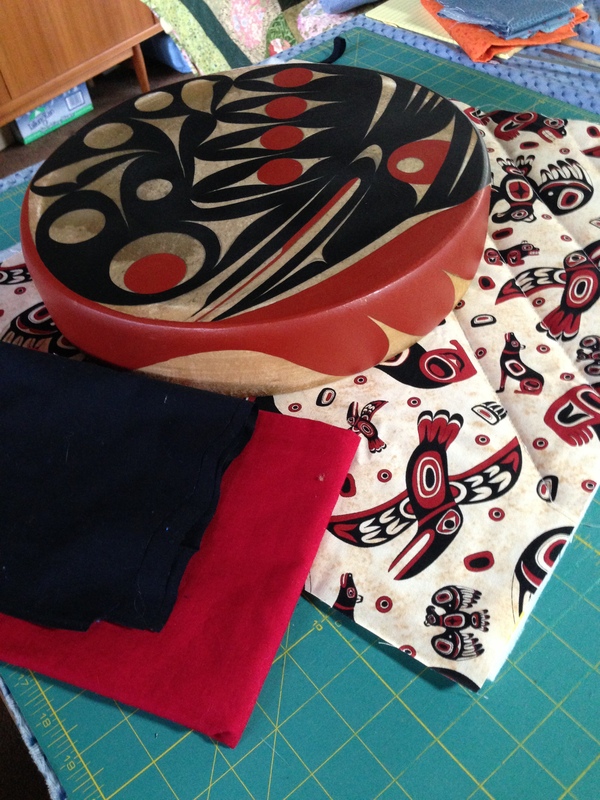 The third project is to make a quilted carrier for Raven’s new drum. 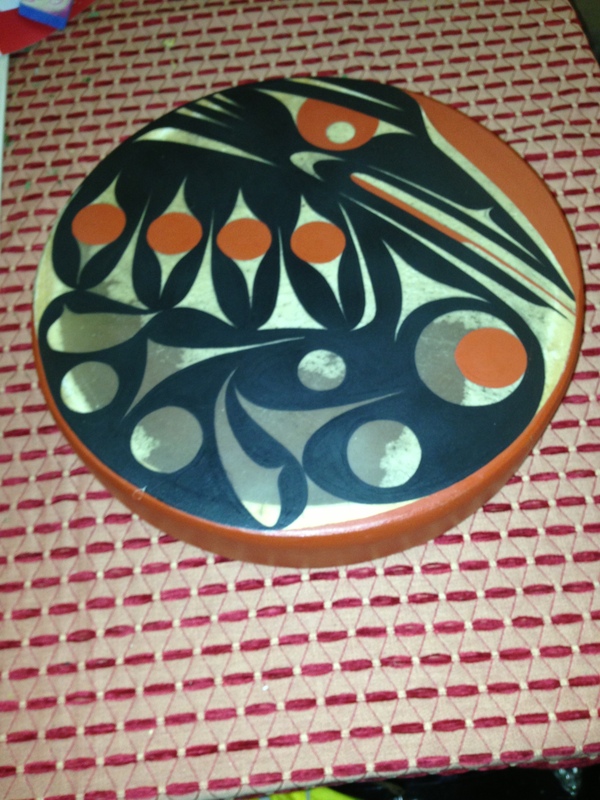 Someone I met recently knew that Raven participated in the dancing and drumming group with the Lower Elwha Klallams, and that he did not have a good drum. She said she had a drum hanging on her wall longing for someone to play it and she wanted Raven to have it. She sold it to us for a fraction of what it is worth. Raven tried it out at practice this week with a huge grin on his face. Now it needs a padded bag to protect it when it is carried from place to place. If there is time I have a new project in mind. Meanwhile I am stocking the fridge and expect to be basically unavailable! 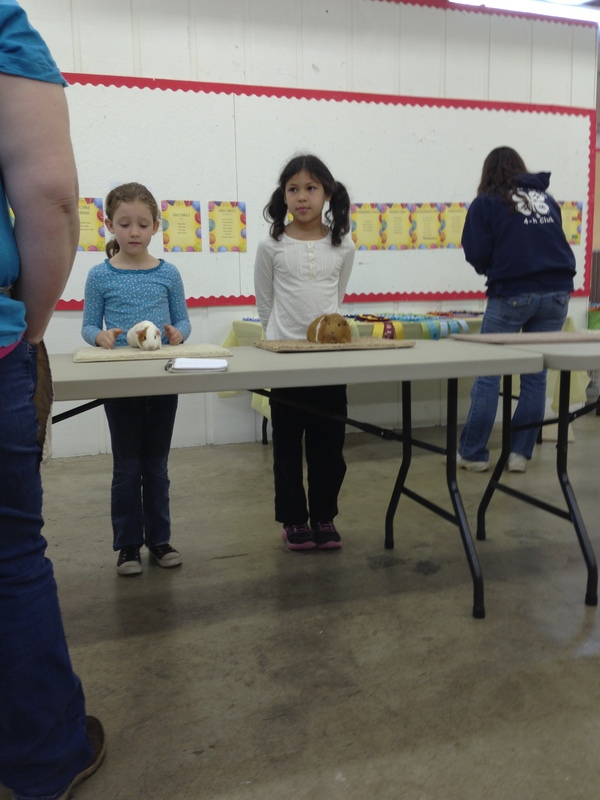 Today is the day of the Guinea Pig and Bunny show for 4-H kids. Preparation started early in the week with discussion about which of our Guinea pigs would be shown, then they needed to be bathed, and clipped and to practice just how to stand on their mats for the judge. Seneca showed her girl, Rudy, who won prizes at the Fair last year. Raven chose Squeaker one of the babies born here last summer. Crowds of kids and Guineas and rabbits were arriving at 8:00 am at the Jefferson County Fairground and once we checked in the kids enjoyed comparing animals. The judge had the kids demonstrate how to handle their Guinea pig and to answer questions about caring for them. The judge explained things to them so this was a learning experience. Raven ended up Reserve Champion in Fitting and Showing. 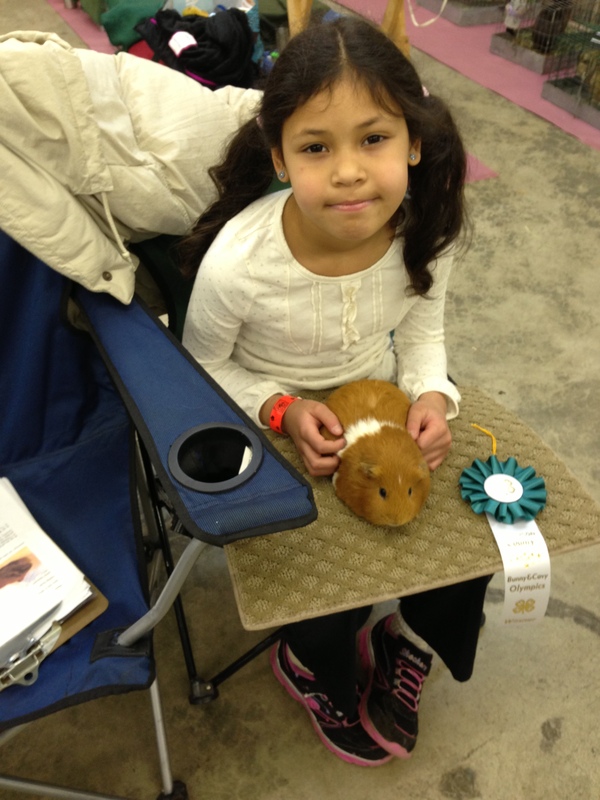 Seneca is too young to be judged but she did get a beautiful rosette and both of the Guineas got blue ribbons. Being parents of kids in 4-H is always an adventure. 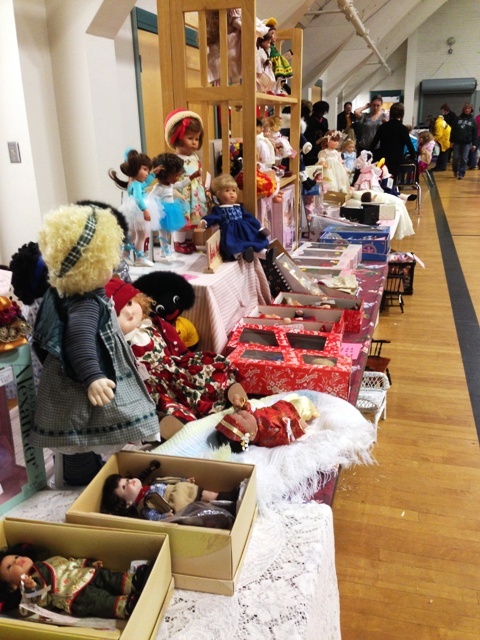 Our doll club presented it’s 17th annual dolls show yesterday. Forty vendors, local and from out of the are, sold dolls, doll clothing, miniatures, bears, and related items. Ted and I no longer have a shop but we maintain Apple Tree Dolls & Bears as an on-line shop and I love having a table at this show. It was perfect day for a doll show, it wasn’t raining or snowing. We had a great crowd. Raven watched intently while one of the vendors restrung three of my dolls whose arms and legs were loose or had actually fallen off. When we got home he begged me to let him try restringing some of my dolls. I had the elastic and equipment basics. I had had tried restringing years ago but never felt I got the hang of it. Raven found a couple of dolls in need, and I decided to let him give it a try. He has strong nimble fingers and had watched so carefully. I let him start on doll from the 80’s not valuable but useless with it’s head loose from the socket. He did a great job, so I told him I would put the doll on eBay and give him half of the selling price. He is listed on eBay I hope he sells! 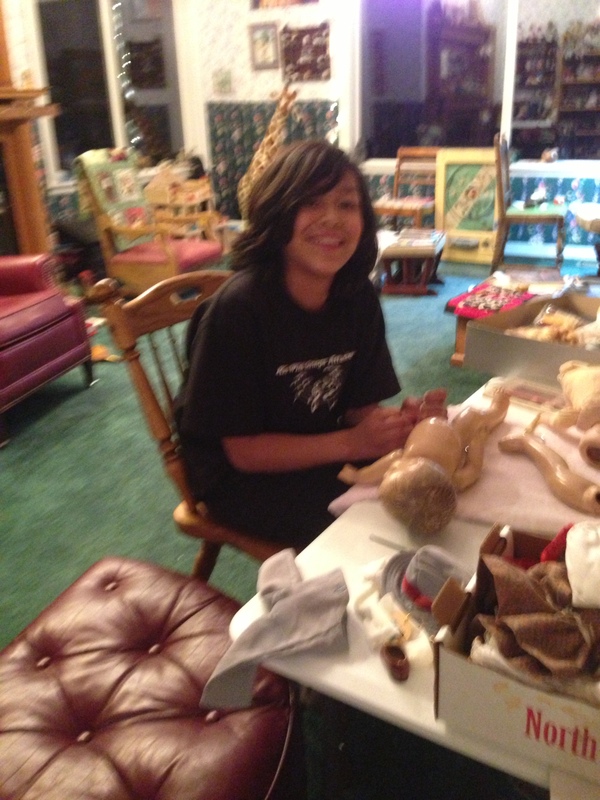 Raven at work on his second doll, a composition Patsy type. Today Raven started in again, he has now strung half a dozen dolls. I hope his enthusiasm lasts. 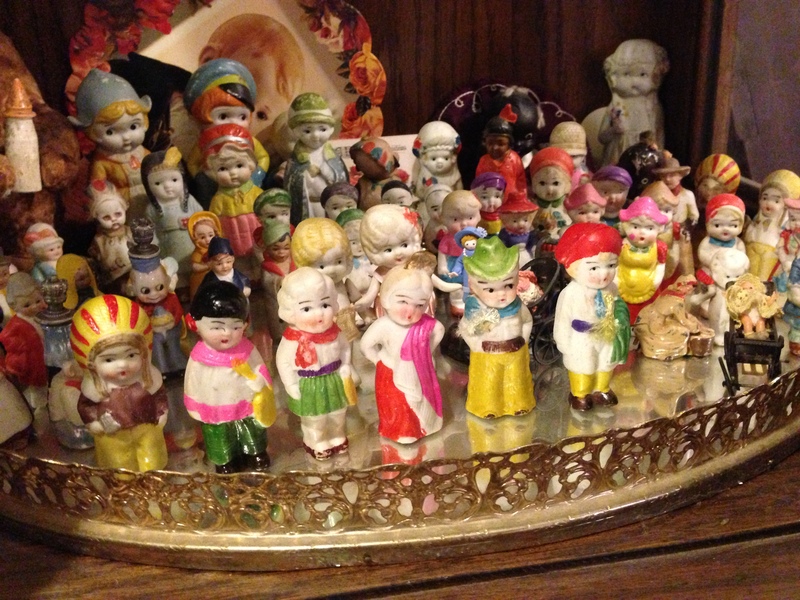 My “buy” at the show, was set of penny whistle dolls. The new ones are the larger ones in front. My treat for myself from the show was a set of very nice penny whistle dolls. 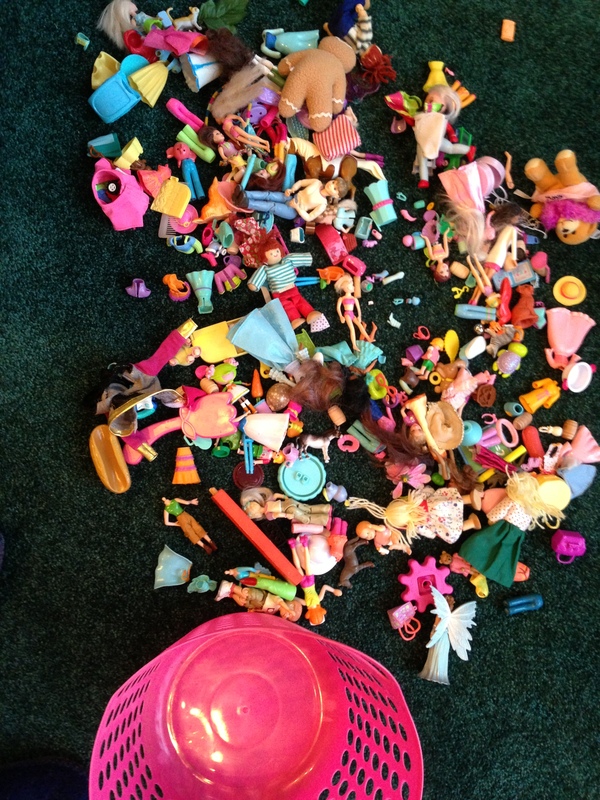 This set has dolls about 2 1/2 inches tall, a little international grouping. The paint was bright with no chipping, which is unusual. The dolls were made in Japan in the 1920s and 30s. They are hollow and if you blow across their feet, you can make them whistle, like blowing across the top of a bottle. I always thought that was why they were called “penny whistle dolls.” But in doing a little research on this I see that I am evidently the only person who calls them “penny whistle dolls” “penny dolls” being the common name. I have collected them for years and have quite a few, but these are in especially nice condition and a bargain at less than $2.00 each. Do you think they were once available for a penny? I also got a nice suprise for Seneca, more about that in a later blog.